Having changed my food style and cooking I have started purchasing more grains and soya products from organic farming at a health food store as substitute of animal proteins, then discovered Provamel organic soya drinks. I had never saw this brand as Provamel products are not sold at supermarkets. Love to see that I’m not only drinking less dairy milk, but I’m also sustaining a sustainable project. 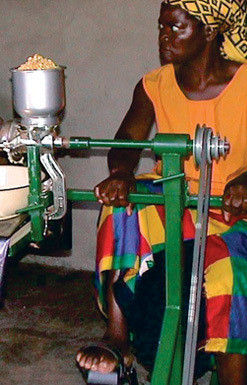 In fact , in Africa Provamel supports the Vitagoat project, a modest production facility whereby a person pedals on bicycle pedals in order to drive a milling system to produce soymilk. The strength of this system is that no electricity, generator or running water is necessary. In addition it is environmentally friendly and precious raw materials are not wasted. In one hour’s time a person can produce roughly thirty litres of soymilk. The Vitagoat makes it possible for people to produce something themselves, which is good for their self-esteem and also gives them with the prospect of additional income. Women in particular can be employed in this way. 5 to 10 jobs are thus created per production facility. Thanks for the article. The vg is a great machine and I have been involved in setting them up in India and thailand as sustainable micro enterprises for orphanages, refugees and ngo’s. If you want more information on my work, send me an email at rickchase@hotmail.com and I would be happy to connect.